Our suture/staple classes includes: a detailed power point presentaion on wound evaluation, closure options, when to leave wounds open, wound cleaning and care options, and teaches each student how to suture and staple wounds. 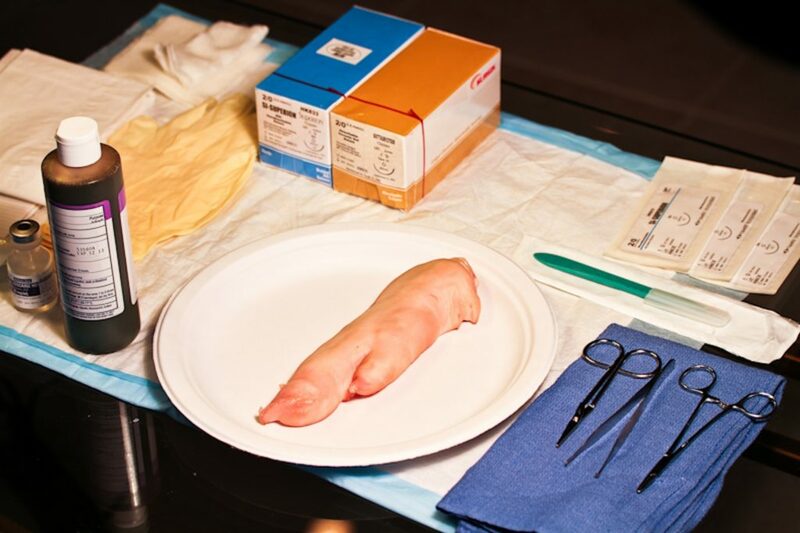 Every student receives a 3 instrument suture kit (to take home also) , 2 sterile sutures (one is used during the class), a pig’s foot to practice on during the class and a special laminated picture suture instruction card. We provide personal attention for each student during the class. To sign up for a class, please email me at dr bones class at aol dot com and tell me which city/date/time you would like an invoice for. 1/12/13 Jacksonville FL, at Overby’s, 12 Noon- 2pm (ish) , Suture/Staple Class $60 per student all equipment providied as above. Bring chairs/folding tables (please) if you are a student, the site is short on these items. 1/12/13 Jacksonville FL,at Overby’s, 5pm-8pm , Suture/Staple Class (visitors welcome, suturing class is full) Please bring chairs/folding tables! 1/13/13 Tallahassee FL , at Perry Theatre, 12 Noon-2pm (ish), Suture/Staple Class, $60 per student, visitors welcome also.